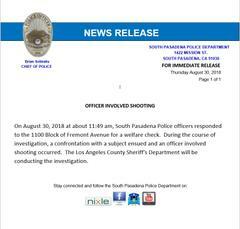 On August 30, 2018 at about 11:49 am, South Pasadena Police officers responded to the 1100 Block of Fremont Avenue for a welfare check. During the course of investigation, a confrontation with a subject ensued and an officer involved shooting occurred. The Los Angeles County Sheriff’s Department will be conducting the investigation.